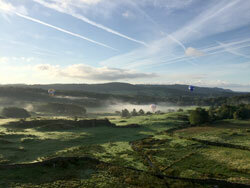 This is where you can get information on where to see balloons in our region, or even join in. Check also the Year Planner link on the left for the complete calendar. The late date for entries is a week or two prior to the meet, (see the Entry Form for details). This is so we can sort out the gas ordering and any housekeeping with the sites but if you have left it too late, don't worry, a late entry is possible at an increased fee level and we will try and fit you in. See also www.balloonevents.org for a worldwide listing. 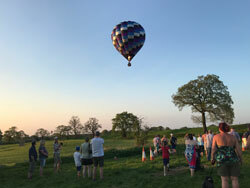 A balloon meet, not just a training weekend, in delightful Lancashire countryside - or Yorkshire countryside, depending on which way the wind is blowing as this meet is right on the county boundary. Meet info sheet link here. Joint meet with PRBA - PRBA Members - please tick NWBAC member box on the entry form as you have free balloon entry too, of course! Flying in the picturesque Ribble Valley near to Clitheroe Castle and under the flanks of Pendle Hill or Longridge Fell - stunning! 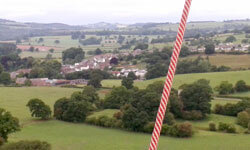 Flying in the Cheshire area, between Nantwich and Whitchurch - a lovely area by the canal. Back at this popular location. Fantastic scenery in the Lake District. Camping & caravanning on site at each. On the first Sunday of the month fly-outs or social events are arranged around the region.